November 16 is the American Cancer Society’s Great American Smokeout, a day that smokers across the nation pledge to quit smoking. Encourage someone you know to quit using tobacco on this day! 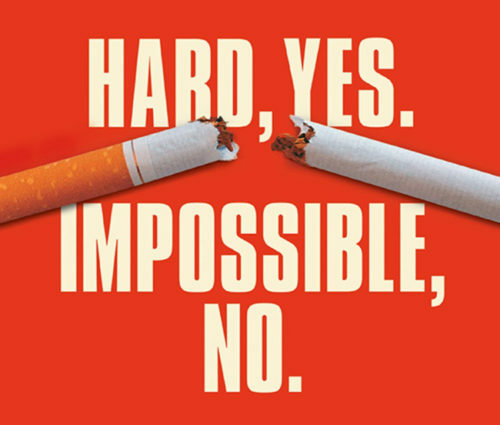 Quitting tobacco is recognized as one of the best things that you can possibly do for your health. Quitting smoking will save you money that would have been spent on tobacco (and related healthcare costs), will make you smell and look better, and doing everyday tasks will leave you less out of breath (such as climbing stairs, or light housework). 2 weeks to 3 months after quitting– Your circulation improves and your lung function increases. 1 year after quitting– The excess risk of coronary heart disease is half that of someone who still smokes. Your heart attack risk drops dramatically. 5 years after quitting– Your risk of cancers of the mouth, throat, esophagus, and bladder is cut in half. Cervical cancer risk falls to that of a non-smoker. Your stroke risk can fall to that of a non-smoker after 2 to 5 years. 10 years after quitting– Your risk of dying from lung cancer is about half that of a person who is still smoking. Your risk of cancer of the larynx (voice box) and pancreas decreases. 15 years after quitting– Your risk of coronary heart disease is that of a non-smoker’s. TriCounty Health Department has several programs that assist our community with tobacco cessation. Ending Nicotine Dependence Classes: A 4 week long tobacco cessation class taught to youth who use tobacco. The class also includes communication skills, stress management strategies, nutrition lessons, and also addresses goal setting. 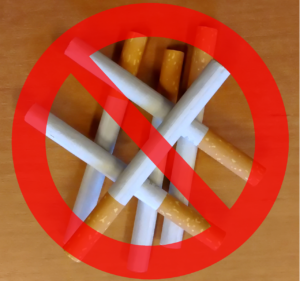 Cessation Meetings: People who are looking for assistance getting started quitting can meet with TriCounty health educators about how to begin quitting. Visit includes advice on quitting strategies, receipt of a tobacco Quit Kit, further information, and recommendation to use the Quit Line to assist quitting attempt. The Utah Tobacco Quitline is an excellent resource for tobacco users who want to quit. They offer free cessation counseling from trained professionals over the phone, through computer, or text, and can provide free Nicotine Replacement Therapy. Call 1-800-QUIT-NOW or go to www.waytoquit.org to access this valuable, free resource.